Darjeeling is the window to the beautiful and exotic Kanchenjunga Mountains. It is a part of West Bengal state today but during the company’s rule Darjeeling- the Land of Thunderbolt was a part of the Sikkim Kingdom and was ruled by the Royal lineage of Chogyal Phuntsog Namgyal. The British spent over 200 years in India and were always on the lookout for hill stations as cool retreats from the heat and dust of the Indian plains. One such attempt was their acquisition of the heavenly and beautiful Darjeeling hill area. The Sikkim-Patti was ‘Convinced’ to cede this territory to British through a deed of a grant on 1st February 1835. In the 18th century Sikkim faced many Ghurkha incursions, the impact of these invasions resulted in Sikkim turning on the British side during the Anglo-Nepalese War of 1815-1816 AD. Sikkim covered twice the area as large as it is now but the size was reduced due to annexations by neighbouring powers and in 1935 the hill area of Darjeeling was ‘Presented’ to the British out of Friendship. This retreat soon became a fashionable resort for British residents in Kolkata who were eager to gaze on Kanchenjunga mountain ranges. In 1840 tea arrived in Darjeeling with a Scottish surgeon Dr Campbell who planted tea bushes brought from China. This stamp was issued by the Sikkim State during the British Raj. 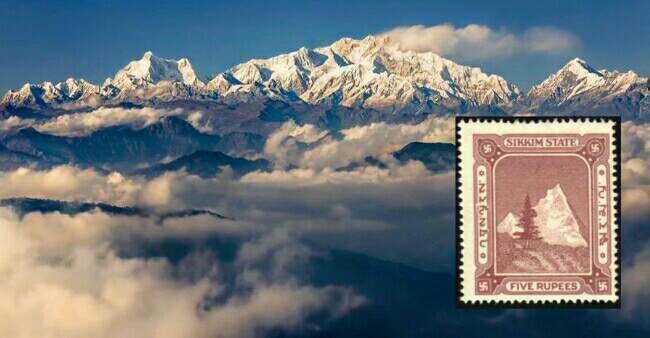 This stamp depicts the image of Kanchenjunga Mountain. Sikkim became the protectorate of India in 1947 and on 26th April 1975 Sikkim became the 22nd state of the Indian union.